One of the biggest challenges in developing integrated photonic circuits—which use light rather than electrons to transport information—is to control the momentum of light. Colors of light travel at different speeds through a material but in order for light to be converted between colors, it needs to have the same momentum or phase. Many devices have been designed to momentum-match or phase-match light at various points throughout an integrated circuit but what if the phase-matching process could be circumvented all together in certain cases? Researchers at the Harvard John A. Paulson School of Engineering and Applied Sciences, together with collaborators from the Fu Foundation School of Engineering and Applied Science at Columbia University, have developed a system to convert one wavelength of light into another without the need to phase match. "For any wavelength conversion process to be efficient, it has to be carefully designed to phase match, and it only works at a single wavelength," said Marko Loncar, the Tiantsai Lin Professor of Electrical Engineering at SEAS and senior author of the paper. "The devices shown in this work, in contrast, do not need to satisfy the phase-matching requirement, and can convert light in a broad color range." 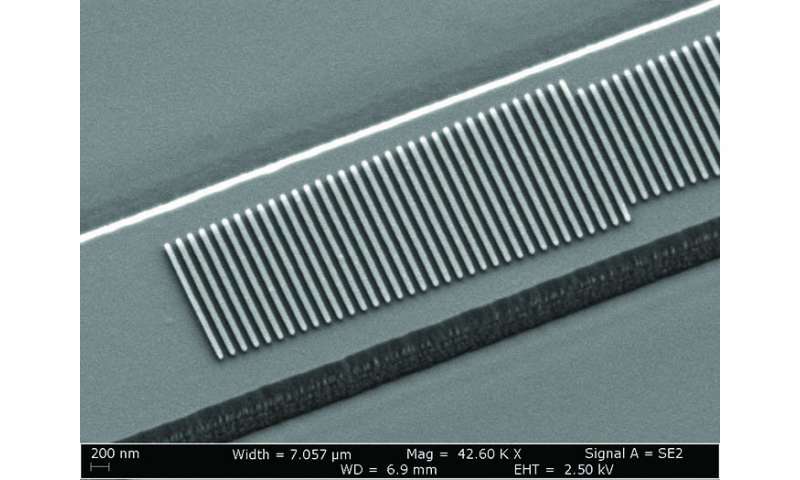 The converter relies on a metasurface, consisting of an array of silicon nanostructures, integrated into a lithium niobate waveguide. The light passes through waveguide, interacting with the nanostructures along the way. The array of nanostructures act like a TV antenna—receiving the optical signal, manipulating its momentum and re-emitting it back into the waveguide. 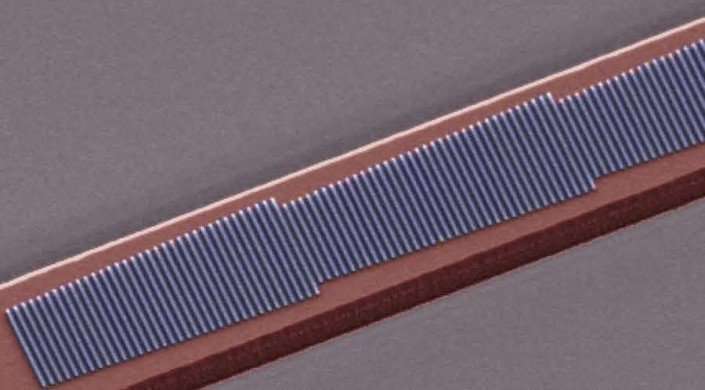 "Unlike most metasurfaces, where light travels perpendicularly to the metasurface, here light interacts with the metasurface while being confined inside a waveguide," said Cheng Wang, co-first author of the paper and postdoctoral fellow at SEAS. "In this way, we take advantage of both the momentum control from the metasurface and a long interaction distance." The researchers demonstrated that they could double the frequency of a wavelength, converting near infrared colors to red, with high efficiency over a broad bandwidth. In previous research, the team demonstrated that they could also control and convert the polarization and mode of a guided wave using a similar structure. "The integrated metasurface is distinct from other phase-matching mechanisms in that it provides a unidirectional optical momentum to couple optical energy from one to another color components—while inhibiting the inverse process—which is critical for realizing broadband nonlinear conversion," said Nanfang Yu, assistant professor of applied physics at Columbia and a co-senior author of the paper. "Future work will demonstrate broadband integrated photonic devices based on metasurfaces for realizing other functions such as optical modulation." If a lot of those could be stack mounted side by side with space between for the wavelengths needed I wonder if they could make a lense you could just simply look through that would convert infrared to red without any electronics? It would probably be really expensive as it would take very many of them to make a lense big enough to be useful but I can think of uses for it all the same.